Chicken is an all time family favorite. And because it is inexpensive, and low in fat and calories, it is the perfect choice for the budget minded and health conscious cook. But as the great chefs know, chicken is also one of the most versatile of all the meats. 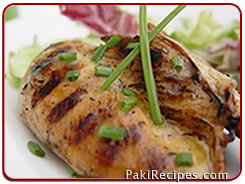 There is a tantalizing selection of chicken dishes, ranging from quick and simple to the exotic and elegant. Pulling the legs gently away from the chicken with one hand, cut through the skin connecting to the leg. Twist the leg away from its natural position until the joints crack. Cut through the joint with a sharp knife. Place the leg, skin side down, and cut through the joint to separate the drumstick from the thigh. Repeat the same for the second leg. Hold the wings away from the body, and pull firmly until the joints cracks. Cut through the joint to separate the wing from the body. Insert the knife blade between the rib cage and backbone to cut the breast from the carcass. Cut the chicken breast in half lengthwise, to make two chicken pieces of chicken breast. You will have six chicken pieces. Cut each breast in half if you want to make eight portions. Pull the skin of the chicken pieces. Insert the knife blade between the chicken flesh and the piece of the cartilage which runs the length of each breast half..
Cut alone the cartilage, pulling the flesh gently away with the other hand. Chicken should be rinsed under cold water and dried thoroughly. Work on the surface that can be washed and sterilized. A chicken cut in 6 pieces yield: 2 breast halves, 2 drumsticks, 2 thighs. A chicken cut in 8 pieces yield: 4 breast pieces, 2 drumsticks, 2 thighs. The size of chicken pieces can vary. So adjust the cooking time accordingly. With food this good at your fingertips, your family may insist on chicken several times a week!